A large and widespread genus of the Old World tropics and subtropics. The first alphabetical list represents the Afrotropical species, and the second is the Indomalayan - Australasian species (several additional African species listed by Larsen (2005) are appended to the bottom). 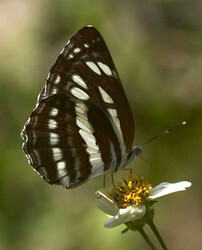 Parsons (1999) states that Eliot (1969) believed that the African and Asian Neptis are not closely related, but Eliot (in Corbet et al. 1992) says of Neptis, "distributed from Europe throughout most of Africa and Asia ...". Eliot JN. 1969. 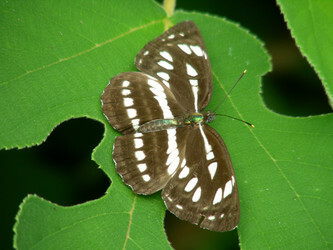 An analysis of the Eurasian and Australian Neptini (Lepidoptera: Nymphalidae). Bull. Br. mus. Nat. Hist. (Ent.) Suppl. 15: 1-155, 101 figs., 3 plates. Page: Tree of Life Neptis Fabricius 1807. Neptidomima Holland 1920. Authored by Andrew V. Z. Brower. The TEXT of this page is licensed under the Creative Commons Attribution License - Version 3.0. Note that images and other media featured on this page are each governed by their own license, and they may or may not be available for reuse. Click on an image or a media link to access the media data window, which provides the relevant licensing information. For the general terms and conditions of ToL material reuse and redistribution, please see the Tree of Life Copyright Policies.